I’ve purposely bought violets before, like this Viola labradorica growing in the miniature garden. It's a nice little bloom. I also once bought seeds for Viola mandshurica 'Fuji Dawn' because it has variegated leaves. 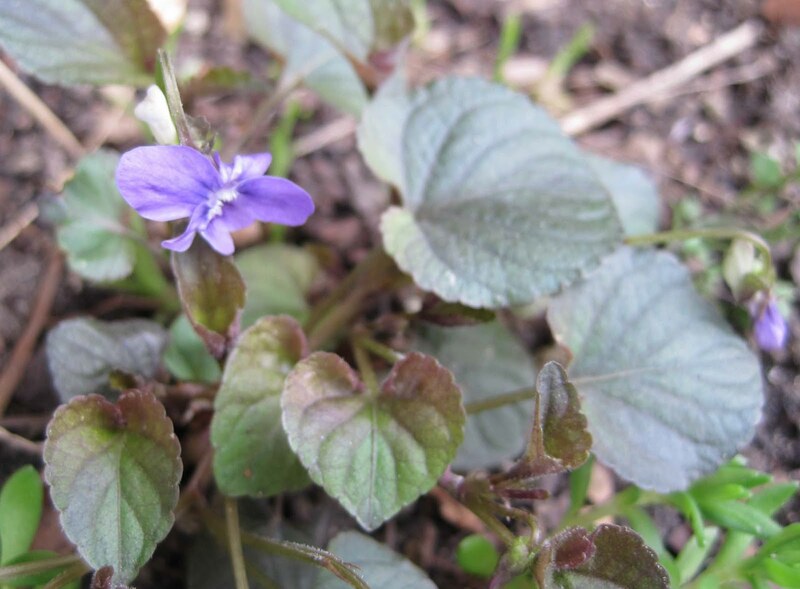 For a few years, I did have violets with variegated leaves, but over time they died out and what is left in that location is this little violet. It’s a pretty light purple, but has long lost the leaf variegation. Elsewhere in the garden, there are a few places where I let violets just grow. These are what I would refer to as common woodland violets. I won’t even speculate on the species, as there are many species out there in the wild. I dug these up from my sister’s garden. They are easy to pull out when they get too aggressive and I usually do thin them out in mid-summer. Of course, one can not fall of into the abyss of violets and the plant family Violaceae without mentioning pansies and violas, the first bedding plants to buy in the spring. One can also not read about the Violaceae family without coming across the term “cleistogamous”. In addition to the showy blooms we see in the spring, many violets also produce small petal-less flowers near the base of the plant in summer and early fall. These flowers never open, self-pollinate and produce lots of seeds. The larger blooms, which are chasmogamous, may also produce seeds. Remind me this summer that I should look for the cleistogamous flowers of some of the violets around here and take a picture of them for Garden Bloggers’ Bloom Day. In the meantime, I’m going to go out now and look at the violets blooming in my garden and scope out other blooms for Garden Bloggers Bloom Day - it falls on the 15th this month, just like it does every month! I inherited oodles of white and purple violets when I moved here - agree totally they are worth keeping! They are cheerful right now and easy to thin out as needed. I have had them at my homes in Tennessee and Alabama and loved seeing them about the garden. I just discovered one yesterday under a plant that I purchased in the fall. It was like seeing an old friend! I hope it thrives and multiplies in that spot. On the other hand, my mother-in-law had them all over her lawn and they really competed with the grass. It was not a good thing. I've had wild violets in my borders since we moved here almost 30 years ago. They wood take over if I let them and don't bloom much at all. I thin them often but have never tried to actually eradicate them. I just get rid of them if something needs to go in that spot. About 15 years ago, I moved into a house with an overgrown, poorly managed, old perennial border. That first spring I was so excited to see so much green. 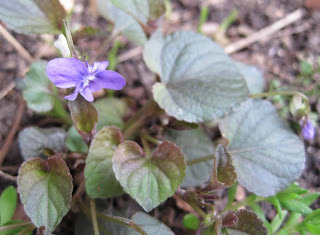 But as the green leaves grew, I realized that all that was left of the old perennial border was the violets. I loved them - filled the house with little vases full of the purple blooms. But for the 4 years I lived there, each spring it was a constant battle to tame them. They loved to creep into the lawn. I was talking with my elderly neighbour about them and she said we could blame her mother who planted a small clump 85 years earlier and that they had propogated throughout the neighbourhood. I love violets too and can't understand how they can be considered a nuisance plant. Maybe somewhere else, but not in my garden! Violets are lovely in all their forms, but it's too dry and stony for them here. Are your violets fragrant? Mine don't seem to be. i've noticed those cleistogamous flowers before, although I never knew the name for them. 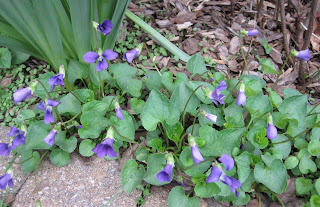 I love the little violets, but have learned to be ruthless in yanking them out of the paths. A few violets are wonderful, such a delightful spring treat. 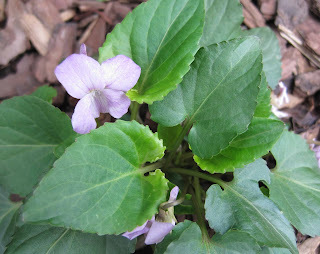 I love Violets...my Father would transplant them to bare spots..he would never ever throw them aside....I do the same. I took some photos of different colored violets today. I will post them soon. 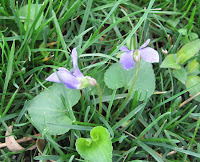 I have tried repeatedly to establish violets and english daisies in my lawn with no luck. If I didn't want them , they'd probably be everywhere. 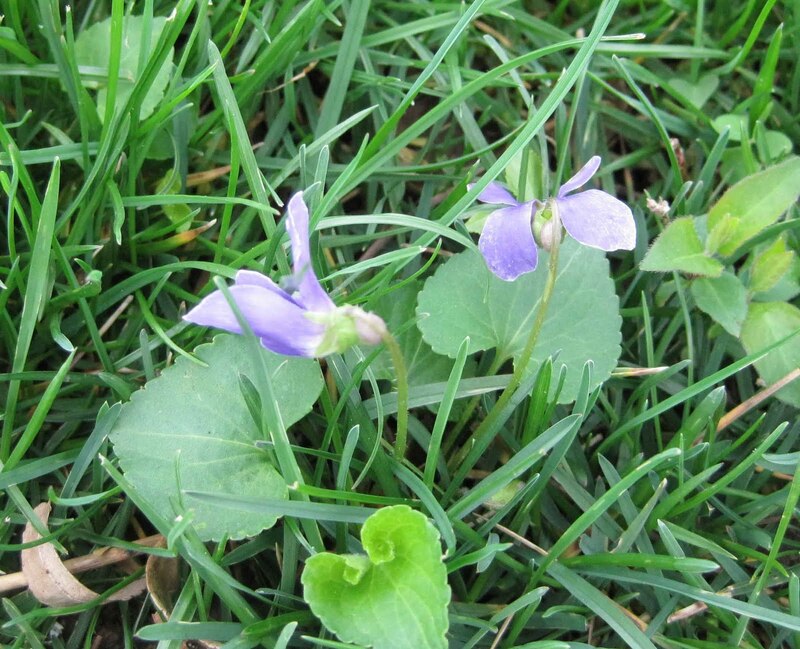 By chance I posted about the violets in my lawn in London yesterday too. I love them. They can stay as far as I'm concerned. Violets are quite fragrant and they are real beauty if strategically placed in the garden. They do have ornamental value as they are easy to grow and come up really great for the ambiance of your garden. Thank you for coming to the defense of violets. 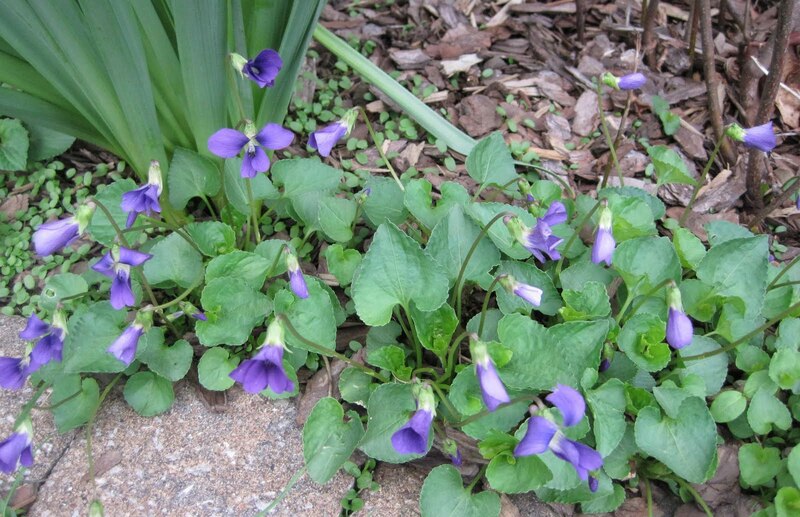 My maternal grandmother had violets along a path of grass in her back yard. I loved them, and knew I would plant some when I had a garden. I don't remember what kinds I have planted, but they all seem to be the light purple kind now. I don't remember if the ones in my vegetable garden were planted by me or birds before we moved here. I don't think my mother-in-law would have planted them. I put leaves and blooms in my salads, and thin from time to time to keep them under control. I was amazed that they took over the butter and eggs plants I had in a wash tub to keep from spreading all over the place. I have a friend who is going to give me more butter and eggs to put in another tub, and I'm planning to let the violets have the wash tub. I enjoyed your post. 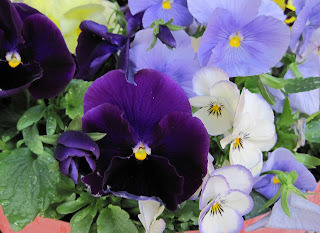 My pansies and violas are beginning to bloom, but my violets are not blooming yet. I like them too" they grow in scattered places through out my yard and I never bother to remove them, because...They don't bother me. I love violets so much! I have a flagstone walk in my garden and I let violets grow all through the spaces in between them. I know other people thing they are weedy but I don't care. I totally agree with you. Violets mean nice weather and spring time. You can always find some to pick. I just love them, so simple but so beautiful. p.s. I read your article in Horticulture and enjoyed it very much. I plant violets in my garden too. They make a great edging! The leaves are edible and mild, good in salad.